The diversity of San Francisco’s residents is beautifully mirrored in its myriad neighborhoods. From the high-end to the grungy, the hipster meccas to the surfer havens, it all exists within the 7x7-mile confines of the City by the Bay. Here, we examine three noteworthy (and drive-worthy) neighborhoods to check out on your next road trip. Stretching just south of Golden Gate Park from 2nd Avenue to 19th Avenue — the most bustling parts along Irving Street and Judah Street — the Inner Sunset is a relaxed and eclectic neighborhood, filled with families and single city dwellers buzzing from coffee shop to restaurant, often stopping en route at an art gallery and boutique. Zipping your way around? Zipcars can be found at 7th Ave./Irving Street, 7th Ave./Kirkham Street, 17th Ave./Lincoln Way, and 19th Ave./Lincoln Way. Hollow (1435 Irving Street; 415.242.4119; hollowsf.com) Start your Inner Sunset tour with a cup of joe at Hollow, a Parisian-feeling, pint-sized coffee shop with low ceilings and tasty pastries. At a little more than five years old, the shop is helping to revitalize the region around 15th Ave./Irving St. — a largely residential area just a few blocks from the neighborhood’s main hub of 9th Ave/Irving St. Don’t leave without taking a peek at the gifts on display, from natural soaps to lip balms to wooden slingshots. Whistle (1311 16th Avenue; 415.379.0199; whistlesf.com) Latte in hand, stroll to the corner of 16th Ave./Irving St. and look up at the big sign that reads “Whistle.” Then, walk slowly around the corner (as not to miss it) and dip into quite possibly the most colorful boutique you’ve ever seen. Opened in February 2013, owner Katie Gaertner sources her items from across the globe and labels each grouping with cards detailing the gifts’ origins. This is the perfect spot to snag a birthday present for that hard-to-buy-for friend with crafty cards, pottery, jewelry, bags, and art for nearly every taste. Nopalito (1224 9th Avenue; 415.233.9966; nopalitosf.com) After hitting your shopping quota at Whistle, walk east down Irving St. and make a left on 9th Avenue, stopping just before you hit Lincoln Way. To your right, you will find Nopalito, arguably one of the best Mexican restaurants in the city, and the owner’s second location (opened in 2012 after the success of its Broderick Street spot). The seasonal sangria is a must, as are the spiced garbanzo beans, enchiladas, and ceviche. Belly up to the concrete bar or wait for a table on the enclosed back patio. Note: Nopalito doesn’t take reservations, but the wait list usually moves pretty quickly. The area west of 19th Ave. is considered the Outer Sunset, a peaceful and residential neighborhood that boasts beautiful views of the Pacific and close access to Ocean Beach. While its most bustling area is around 45th Ave./Judah St., art galleries, coffee shops and restaurants can be found in small corners of the sprawling ‘hood. Sprawl is no prob for Zipcars, which can be found at 20th Ave./Irving St., 40th Ave./Irving St., and 42nd/Lawton St.
Andytown Coffee Roasters (3655 Lawton St.; 415.753.9775; andytownsf.com) From 19th Ave., head west down Lawton St. until you hit 43rd Ave. Lost? Look for a crowd standing on the sidewalk in the middle of a residential area and you’ll know you’re in the right place. That line will be for Andytown Coffee Roasters, which welcomes patrons with floor-to-ceiling windows, a giant wooden slab table at the front, and the friendliest staff imaginable. Splurge on a few bread offerings (the cheddar and scallion scone is delicious, as is the soda bread), buy a colorful coffee mug from the display along the wall and notice the horseshoe above the door on your way out. 3 Fish Studios (4541 Irving St.; 415.242.3474; 3fishstudios.com) Walk off your bread binge with a stroll north to Irving St. and west to 46th Ave. There, you will find 3 Fish Studios, a working art studio and gift shop run by married couple Annie Galvin and Eric Rewitzer. The cavernous space is littered with unique prints, most focused on California (Annie has an “I Love You California” collection for sale) as well as pottery and other artwork done by local folks. Ask about their printmaking classes and be sure to check out the studio’s back patio, which features a custom picnic table in the shape of California. Outerlands (4001 Judah St.; 415.661.6140; outerlandssf.com) At the corner of 45th Ave./Judah St. is Outerlands, the Outer Sunset’s favorite dining spot — so famous it doesn’t need a sign. Just look for the light blue building and people mingling outdoors. There is almost always a wait on the weekends, but it’s worth it for the open-faced sandwiches, homemade bread, and pancakes (lunch and dinner are also served during the week). The restaurant reopened in May 2014 after a five-month expansion and renovation project, and today features a wraparound bar and tasteful, indoor wood paneling. Clear on the far east side of town, south of AT&T Park (home to the San Francisco Giants baseball team) is the uber hip Dogpatch neighborhood, stretching east from I-280 to Illinois St., south from Mariposa St. and north from Cesar Chavez St., that, until the late 90s, was strictly industrial. Today, you can find loft spaces as well as shops, restaurants, and innovative bars. Speaking of innovative: Zipcars can be found at 3rd St./18th St. and Minnesota St./20th St.
Piccino Coffee Bar (1001 Minnesota St.; 415.824.4224; piccinocafe.com) Leafy Minnesota St. is a staple in Dogpatch, largely thanks to Piccino, an Italian restaurant (try the pizza) located inside a yellow house with light green trim. Just next door is the eatery’s coffee bar, a small shop that sells Sightglass Coffee (a San Francisco original) and yummy pastries — a great place to stop while on a tour of the neighborhood. Little Nib (807 22nd St.; 415.489.2882; recchiuti.com) Don’t go too far, because about 300 feet away, you can grab some chocolate to go with your coffee. Little Nib is the sister store of Recchiuti Confections, located inside the Ferry Building. The shop sells boxed chocolates, chocolate bars, chocolate sauce, burnt caramel almonds, and more. Pick up a few Fleur de Sel Caramels — known as some of the best caramels in the country. Smokestack at Magnolia Brewing Company (2505 3rd St., 415.864.7468;magnoliasmokestack.com) Those in the know (which now includes you) go to a spot without a sign (just look for the address): Smokestack at Magnolia Brewing Company, a bar and barbecue joint. 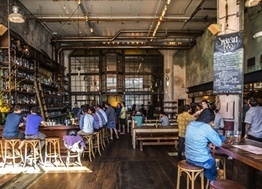 Smokestack is a new entrant to Dogpatch, having opened in May, and is already a huge hit with locals for its tasty food and drink (same owners as Magnolia Gastropub in the Haight District) and breathtaking décor. The former factory is completely transformed (imagine if a 1920s saloon and a modern loft had a child) with exposed piping, high ceilings, hanging light bulbs, and a marble, saloon-style bar. Gaze, and enjoy.